Here are some preliminary steps that you need to perform before you can use the tool. Task 1: It’s always recommended to backup your data and files. Task 2: Install USB drivers for your device on the PC. If you have Samsung Kies installed, it will install all the required drivers. You can install the drivers without installing Kies by downloading the drivers package from here: install Samsung USB Drivers without Kies. 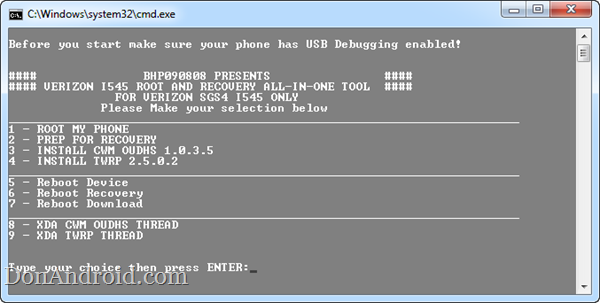 Task 3: Enable USB Debugging on your device. Task 4: Make sure that “unknown sources” option is checked in Settings > Security section. Task 5: Finally, make sure that you don’t have a password on lock screen. Step 2: Extract the downloaded zip file. Step 3: Navigate to I545ALL-IN-ONE-TOOL directory inside the extracted directory. From here you can select any of the options to root and flash custom recovery on Galaxy S4 Verizon smartphone. If you are on stock ROM, you will have to root your phone first before moving on to installing custom recovery. The tool is easy to use and will guide you along the process. You just got to follow the instructions.